This is an amazing sign that your patients will love. Dentist inspired and created....this is the 1st piece in our new line with other pieces to come soon. 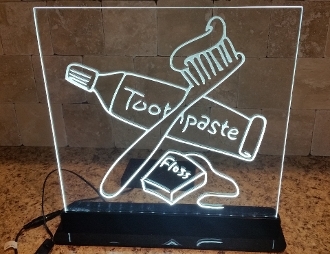 It is an approximately 12" x 12" acrylic piece piece inside an LED light base. If engraving is chosen the name of the dentist will be placed on the top left corner; there is a limit of 11 characters. Included are both the battery pack with batteries and A/C pack for versatility. Please allow for 10-14 days to fabricate. A free zip2dentist membership will be given as well.